Healthy, natural treats for your dog that are already in your kitchen? Yes! No trip to the pet store required. Many fruits and vegetables make wonderful treats for dogs. Obviously, they are nutrient-dense foods which makes them great for health. They are often really convenient because many are staples you probably keep handy for your family anyway. And unlike many dog biscuits or similar treats, they are low in calories. This really helps to relieve the challenge that many of us face in striking a balance between treating our pups and managing a healthy weight for long term health overall. So what are some simple, natural dog treats to incorporate into your routine? Here are some of our favorites! An apple a day doesn’t necessarily keep the veterinarian away, and a whole apple would be a bit much for a dog anyway, but they are good for dogs just like they are people! Full of nutrients and fiber, these are great snacks. Just be sure not to let your pup have the seeds or the core. Frozen or fresh, green peas are good treats, and most dogs love them. Hand your dog a couple as training treats or even put some in their bowl. Easy-peasy! Loaded with beta carotene and other vitamins, carrots are almost guaranteed to be in your kitchen anyway. Why not cut up some bite-sized pieces and use them as a healthy reward? Some dogs can be bad about swallowing without chewing (we’re looking at you, labs and beagles), so if yours is one, be sure that the carrot pieces are an appropriate size. Dogs can eat green beans too! Just be sure that cooked green beans aren’t seasoned. Plain, please. These are a great source of greens and fiber. Just like humans, most dogs love watermelon as a tasty, hydrating, and beneficial snack. Be sure to remove any seeds, and don’t give your dog the rind. Cooked sweet potatoes may not seem to smack of convenience, but since they keep well in the refrigerator, it’s actually really simple to roast up some extra to share during the week with your furry family member. It’s best to keep them plain. Do not give dogs raw potatoes of any kind. We all know that bananas are loaded with healthy nutrients. Most dogs love them, too, so they are a natural choice that you probably keep handy all the time. Just be sure not to overdo it. Given their high sugar content, it’s best to give bananas to dogs in moderation. Cruciferous veggies have well-known health benefits, and broccoli is a good choice for pups. Feel free to give them a few small pieces as a treat. These can be raw, roasted, or steamed, just unseasoned please. Like humans, dogs often have an easier time digesting high-fiber foods that have been cooked, but either is safe. Cooked squashes are great natural treats for dogs! And since there are several kinds of squash that are safe for dogs, this is a good option year round. Butternut squash, yellow squash, or zucchini are all great. Even pumpkin! Just be sure to remove seeds, and for the butternut, the rind, as well. Strawberries are sweet little vitamin C nuggets that dogs love. Like bananas, they are high in sugar, so just keep that in mind when you decide how many to give. 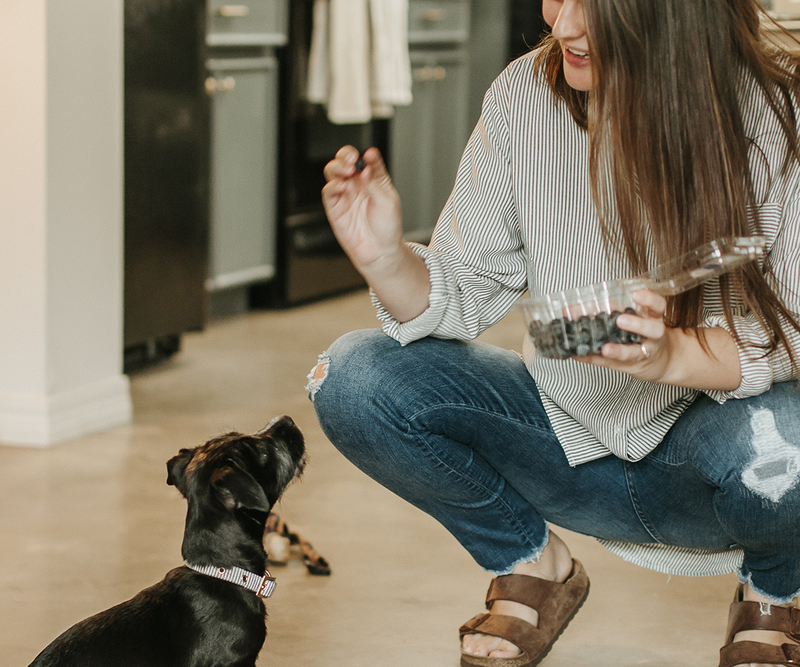 Like strawberries, blueberries are great, healthy, and easy little treats to share with your pup! When trying out new treats for your dog, it’s always best to start with small portions, and see how your dog’s GI tract responds. There are also a number of foods in your kitchen that can be dangerous for dogs to consume, so check back soon for a list of common foods to avoid.